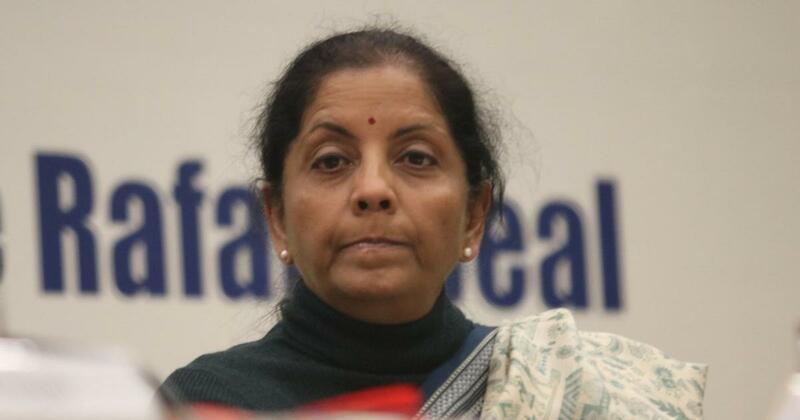 New Delhi, Feb 8: Defence Minister Nirmala Sitharaman on Friday rejected Congress President Rahul Gandhi's charge that Prime Minister Narendra Modi ran parallel negotiation for the Rafale deal and accused him of provoking the armed forces against the government. "Today I object to what Rahul has said -- he was telling Air Force pilots and officers 'look what Prime Minister is doing to you'. What does this mean, what is going on in his mind? Does he want to provoke them? Does he want to make them stand up against the government? Is it a responsible job of the Opposition? It is very dangerous," she told media outside Parliament. "Congress has become a toy in the dirty game of multinational corporates. Their language is not in the interest of the country," she alleged. Sitharaman said that she was "very shocked" to see this attitude. "Rahul Gandhi, in his press conference today, called the PM a thief and me a liar. I had also said earlier that as we have not come from a known family, so they try to tarnish our image." Lashing out at an English newspaper for carrying out a "one-sided" story, the Defence Minister said, "One newspaper has printed a file noting, which is written by (former) Defence Secretary. In the same note he is saying Defence Minister should make a statement. "The then Defence Minister (Manohar Parrikar) has seen that noting and also signed it. What was the response of then Defence Minister Parrikar? I said the same thing in Parliament." Slamming the media house, she said, "If the news report carried one noting, then it should have also carried the response of the then Defence Minister in its news report. That is ethical journalism." Quoting the then Defence Minister's reply to that file noting, Sitharaman said, "Your note is right, but there is no need to get excited so much. Everything is alright. This was Parrikar's reply, which is there in the files of the Defence Secretary." "I am sorry there was selective noting and building an issue falsely on it," she said, adding that the response of the then Defence Minister was very clear. She also asserted that on the direction of the same Defence Secretary and the Member of the Negotiating Committee with their signatures, the file went to the Cabinet Committee on Security and Cabinet. "Only after that clearance was given and then an agreement signed," she said. Defending the Prime Minister and the PMO, Sitharaman said, "If the PMO asks for the progress in a matter, can it be considered interference or parallel negotiation?" Referring to Sonia Gandhi, who held the post of the Chairperson of National Advisory Council (NAC) during the UPA governments, she said, "Was Soniaji interfering in the working of every ministry or running a parallel cabinet or snatching the rights of any minister? "Highlighting a selective part is not good. I have a lot of expectations from Congress," she added.